The reason for my rule is that butterflies (and hummingbirds, for that matter) are among the most popular designs for tourist pieces. You rarely see them depicted in more serious artistic works. I believe that there used to be a Butterfly family crest among the Haida, and there are still Hummingbird crests among several of the northern First Nations, but today, these designs are often trite and blatantly designed to appeal to tourists. Often, they show a degree of cuteness unlike any other designs. 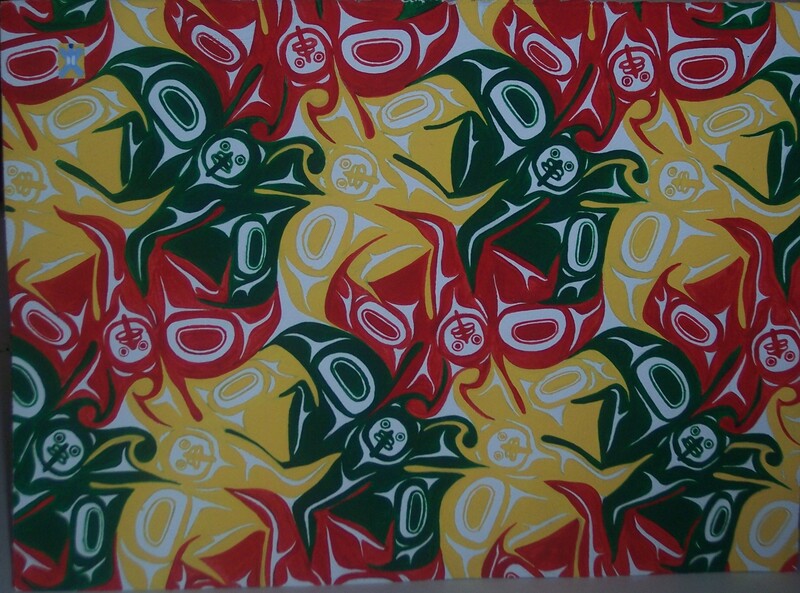 I’ve joked that these designs are the Hello Kitty of Northwest Coast Art. But the northern First Nations, as I understand things, are even more scathing: satirically, they call butterflies and hummingbirds the white people’s crests. Fox goes on to explain that his work is about harmony and teamwork. I’m not sure if he is missing the satiric intent, but it is hard to argue with his results. Fox has a separate career as a painter mostly in the Canadian Impressionist style, and in his butterfly studies, he has combined traditional designs with patterns inspired by the surrealism of M. C. Escher. Like Escher’s work, “Butterflies #3” has a constant shifting of figure and ground. At the same time, the shape of the butterflies’ wings, with their ovoids and elongated T-shapes continually suggest other shapes, such as the beaks of ravens. By combining his interests in mainstream and Northwest Coast Art, Fox has created a series of paintings unlike anything anyone else is doing, and I look forward to seeing how his work matures in the next few years. Meanwhile, his butterfly series is a promising start.